On 21st October Universal music will be releasing the latest in their Classic album selection series. Previous releases include Motorhead and Thin Lizzy and like those releases this is a box set containing 6 classic albums from the band - in other words in this case it's all six of the band's studio albums. The six albums were released over a period of seven years and are "The Boomtown rats", "A tonic for the troops", "The fine art of surfacing", "Mondo Bongo", "V Deep" and "In the long grass". As with other releases in the classic album selection series it's very competitively priced - £18.99. Thats just over £3 each for the six albums included in the collection, and when you think that you'll pay £12-15 for a typical new album then that makes this a bargain. Certainly if you compare it to the recently released compilation album "Back to Boomtown: Classi rats hits" it is a great deal - the compilation has one disc of 16 songs whereas this release has 88 tracks on 6 discs. The only thing you don't get with the Classic album selection is the two new songs "The Boomtown rats" and "Back to boomtown" but having listened to them I definitely think you're better off without them. 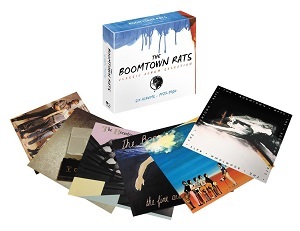 So the collection includes all six Boomtown Rats albums, but it also includes bonus tracks that were included in the 2005 reissues, so it really is an impressive collection for fans who don't have all the albums. The band are best known for two of their five top ten singles ("Rat trap" and "I don't like Mondays"), but they also had a further six top 30 singles that didn't make the top ten. So if you only know them for the singles then is this collection going to be of interest? Personally I think it is - there's so much here for a low price that even if you only end up liking a dozen songs out of the 88 then thats still pretty good value. There are lots of good songs on these albums that have been overlooked really as people focussed on the hits. These days of course Bob Geldof is best known for his charity work (and strangely named daughters), and thats been the case ever since he organised the Band Aid single (Do they know its Christmas) and the Live Aid concert, but this release reminds people that he was first and foremost a musician who has released a strong catalogue of songs. This is definitely a good release - six albums for a budget price means it's definitely worth a listen and there's plenty of good stuff on these albums to enjoy. 13. How Do You Do ?